– Inigo Montoya, the (film of) The Princess Bride. Novel and screenplay by William Goldman. This week, I was in Gegynog at the final meeting of the Gwella participants. While there, a few people mentioned the phrase digital literacy. 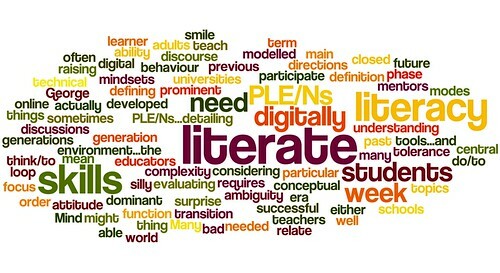 A variation of the phrase cropped up in the introduction to the readings for Week 6 of #PLENK2010 (see the Wordle above). It’s also a key theme of Robin Good and Howard Rheingold’s post New Media Literacy in Education which was one of the readings. Furthermore, it popped up in Wednesday’s discussion as reported earlier. The persistence of this phrase makes me think that it’s a topic that I can get my teeth into for the remaining four weeks of PLENK 2010. Perhaps I’ll be able to find out what it means. On Sunday, I finally found the time to listen to the recording of guest Will Richardson, author of Blogs, Wikis, Podcasts, and Other Powerful Web Tools for Classrooms, from Wednesday’s #PLENK2010 live Elluminate session. In this session, Will gave a short presentation Using PLE’s Successfully and a couple of things came up. This is a pretty sophisticated set of competences that I would struggle to demonstrate. It’s even more challenging, when you consider that these are the aspirations of a professional body for teachers of *high-school age* children! Do we even do this for our undergraduate and postgraduate students? Would I and my colleagues be competent to teach these high-level **digital literacies ** to them? – Be personal … sometimes. I can see how these principles might apply to my own PLE, which for me is centred around this and the [Learning Lab blog](http://llcommunity.blogspot.com/). But it’s not quite so obvious how it might apply to our students. 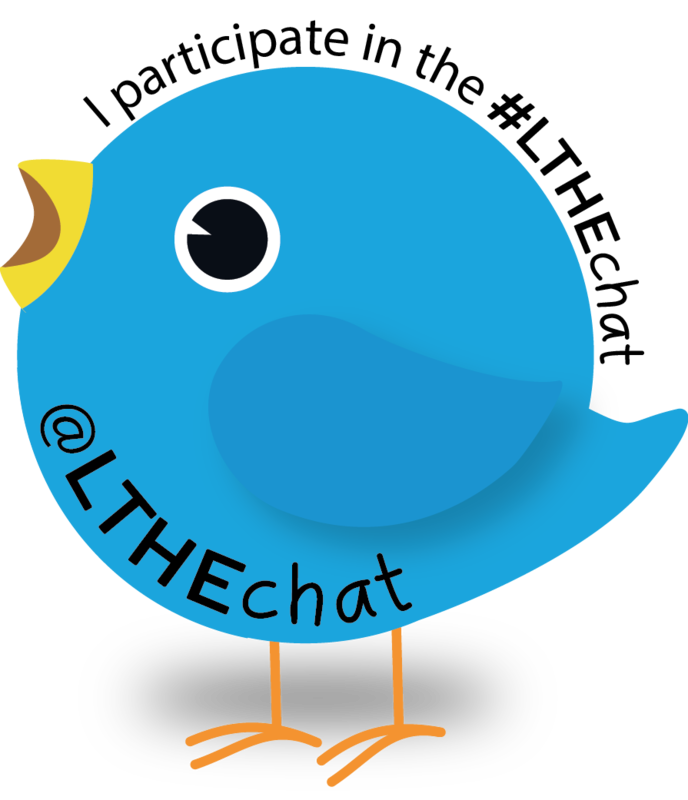 Too often, we try to get them to engage with the tools of a PLE by telling them that it’s *good* for them, and we then try to get them to engage with a topic related to a course we are teaching or a topic within a course of *our* choosing, and we try to force them to engage by assigning credit. Would they engage more if they were able to *pursue their passion* while we supported their learning as mentors rather than assessors? In the discussion, will mentioned the Royal Society for the encouragement of Arts, Manufactures and Commerce (RSA) animation [Changing Education Paradigms](http://comment.rsablogs.org.uk/2010/10/14/rsa-animate-changing-education-paradigms/) which is based on a [speech given to the RSA by Sir Ken Robinson](http://www.thersa.org/events/vision/archive/sir-ken-robinson) %5B3%5D. An idea, and its presentation, well worth sharing. 1. *Definition of 21st Century Literacies*, National Council of Teachers of English (NCTE), February 15, 2008. URL: [http://www.ncte.org/governance/literacies](http://www.ncte.org/governance/literacies). 2. Barbara R. Jones-Kavalier and Suzanne L. Flannigan, “Connecting the Digital Dots: Literacy of the 21st Century”, *Educause Quarterly*, Volume 29, Number 2, 2006. URL: [http://bit.ly/dabAsD](http://bit.ly/dabAsD). 3. Sir Ken Robinson, *Changing Paradigms*, RSA Edge Lecture, 16 June 2008. URL: [http://bit.ly/bMz8FM](http://bit.ly/bMz8FM). video: [http://youtu.be/mCbdS4hSa0s](http://youtu.be/mCbdS4hSa0s).